Who owns the agenda for education change? 3. Working together tenaciously and flexibly towards those shared goals. In 2016, parents and educators from KIPP LA’s Comienza Community Prep elementary school in the city’s Huntington Park neighborhood decided on a campaign to seek more middle school seats for their children. Six years prior, in the summer of 2010, Nina Trujillo wasn’t sure about the three strangers approaching her in a park, asking if she had any children. She did, in fact, have a daughter, Michelle, who was going to be entering kindergarten that fall. And Trujillo wasn’t sure if this was any of their business. The three extroverted strangers turned out to be recruiting for a new charter school. KIPP Comienza (Spanish for “to begin”) opened its doors that very year with the promise to provide an excellent education. The school eventually became an integral part of Trujillo’s family. KIPP Comienza also kept that promise to Trujillo’s community. In 2016, 86 percent of Comienza fourth-graders met or exceeded standards on the state test in English Language Arts (59 percent exceeded). In math, 81 percent met or exceeded standards (52 percent exceeded). This made KIPP Comienza the highest-performing school serving low-income students in all of California (90 percent of Comienza’s students qualify for free or reduced-price lunch). In contrast, the two closest local district elementary schools saw just 17 percent to 20 percent of fourth-graders meet or exceed standards in ELA, and 16 percent to 31 percent of students meet or exceed standards in math. When it was time for Trujillo to transition her daughter Michelle from the fourth to the fifth grade, she was faced with the hard reality that KIPP LA, by law, could not provide an enrollment preference from KIPP elementary schools to KIPP middle schools. Michelle would have to enter a lottery for each of KIPP’s middle schools and hope for the best. Trujillo filled out the forms for each lottery. She went to one, and Michelle’s name was not called. She went to another, and Michelle was again not called. With every denial came tears and anxiety. It wasn’t until the third KIPP middle school lottery drawing that Michelle’s name was selected — on the second-to-last draw. Trujillo still tears up when recalling that moment. So Trujillo, other Comienza parents, and KIPP educators decided to act together, investing in the time and the commitment. 1. Investing in relationships built on trust, respect and partnership. It was a journey for KIPP LA to build deep, genuine relationships with its families. 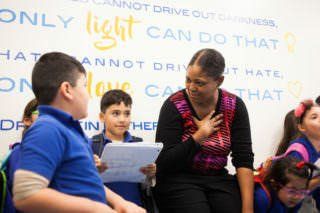 This partnership permeates every aspect of KIPP Comienza’s culture — from initial engagement with parents in their homes, to active parent roles at the school, to involvement in school governance. KIPP LA board members meet with parents as part of their annual assessment of the region’s performance. Teachers take the time to share with parents what’s happening in the classroom and how parents can support that at home. Parents invite teachers to their homes for family events on weekends, and the teachers come because they feel part of the family. “It’s a family reunion every morning at Comienza,” one parent said. And as with any relationship — and in any family — it’s not without its conflicts. But because of a culture of and an investment in partnership, parents and teachers can engage directly. A strong Family Leadership Council at Comienza meets regularly with school leadership to represent the voice and needs of parents. 2. Being transparent about interests and identifying shared goals. As a high-performing charter management organization, KIPP had an interest in opening more schools in LA. Trujillo felt the call to support her community based on her experiences. But most Comienza parents were focused on interests literally closer to home — another KIPP middle school in their neighborhood to increase the chances that their children could get a continuous high-quality TK-8 education. Some were interested in broader systemic change, and others in the specific needs of their own children. Everyone, however, was clear about their interests, and in this case it wasn’t difficult to identify a shared goal that coincided with all interests: more KIPP middle school seats for Comienza families. Now, how to make that happen? 3. Working together tenaciously and flexibly towards those shared goals. Starting in 2015, KIPP Comienza parents, working together with KIPP staff, began to organize to get KIPP Fuerza approved, with regular planning meetings. KIPP LA found an aspiring leader to go through KIPP’s year-long Fisher Fellowship leader preparatory program to open a school in the summer of 2016, and KIPP wrote the extensive and detailed new charter application. Charter approval required a positive vote by the Los Angeles Unified School District school board. To raise the profile of Comienza parents and their influence on those with authority, the school and parent community organized opportunities to learn about the civic landscape and the influence of the school board on charter schools. They also registered families to vote in upcoming local elections for the LAUSD school board race. The school even hosted a candidate forum for school board members, though only one candidate showed up to listen to the parents and engage in dialogue. By November, despite its organizing efforts, the collective Comienza team was concerned about getting Fuerza approved by the school board. So it was time to get creative. What if they pursued not only Fuerza as a new school, but also an amendment to Comienza’s charter to let it grow directly to serve grades TK-8? This would also have the added advantage of having no lottery in transitioning from elementary to middle. The team decided to simultaneously seek both the Comienza amendment and the Fuerza new school approval from the school board and bring both for a vote – in that deliberate order – to the March LAUSD school board meeting. The plan was that if the Comienza amendment was approved, they would then pull the Fuerza proposal from the LAUSD agenda. This gave both the KIPP team and the school board more options to work with. It was a pivot from what parents originally organized for, but a necessary flexibility that all believed would improve the odds of achieving their shared goal. In preparation for the March LAUSD Board decision, over 200 parents wrote letters in English and Spanish to the superintendent and school board. Then teachers wrote letters. A set of parents stepped forward to testify and worked with staff and peers to prepare their testimony. And to paraphrase an old military saying, “strategy and tactics are nothing without logistics.” On the day of the school board meeting, Comienza organized a small group of parents to watch kids who were dropped off at school at 6 a.m. This enabled the majority of parents to get in line by 7 a.m. to be admitted into the School Board meeting later that day. A separate set of parents were scheduled to take over watching children starting at 5 p.m., as it was unclear what time they would be allowed to testify and when a vote would happen. Comienza rented a bus to transport 80 parents and had box lunches delivered to the parents who waited outside in the California sun from 7 a.m. to 1 p.m., when they were let into the building. The parents rushed to the front seats, all wearing KIPP t-shirts in bold colors, ensuring their presence was clear and visible to the school board. The school board advanced its business, and a speaker ahead of the parents got up and harshly criticized charters. This was the first time most of these parents had heard someone attack their school in a public forum. It made the parents that much more nervous and that much more determined to press their agenda. “I don’t want any parents to go through the lottery pain I went through,” Trujillo replied. And then, before the parents could testify, the school board decided by unanimous consent to approve the extension of Comienza to a TK-8 school. KIPP pulled the Fuerza application from the agenda. The parents broke down crying, not at first sure what had happened. It felt almost anti-climactic. They hadn’t yet given their speeches — but they had made their power and presence known. Interests aren’t always going to coincide so easily as they did for KIPP Comienza. “Parents like those at Comienza, the more wins they get, the more power they realize they have, and the more they use it; including pushing agendas beyond KIPP,” said Mayra Salazar, KIPP LA’s family and community engagement manager. As parents and communities learn to better exercise their power, they will choose broader agendas, which won’t just be focused on education. Their agendas won’t always be fully aligned with the interests of education reformers or funders. And parents will exercise their power to hold schools accountable for results – both public district schools and public charter schools. This is what makes the work complicated, though no more so than the problems of educational inequity this work aims to solve. As education reformers, we have to invest our time and effort to earn that trust if we want transformational change for communities. That means asking and listening to understand the needs and priorities of the communities we serve. It requires us proving our value and credibility to them before engaging in a dialogue about our agenda. And where we forge an agreement around a common agenda, we then have to possess the fortitude to stick with parents through the difficult long-term struggle for systems change, which will have its wins and setbacks. However, if we can commit to doing this, we won’t be alone in trying to achieve change. We’ll both be powerful partners — and have powerful partners. Alex Cortez is a managing partner at New Profit and leads the organization’s Reimagine School Systems Fund. Yordanos Eyoel is an associate partner at New Profit and co-leads the organization’s Reimagine School Systems Fund.